Panna cotta de chèvre frais et sa macédoine de légumes is a summery dish. It was such a sunny day today in the Bay Area, so I decided to make something refreshing and light. In case you don't know, panna cotta is a firm jelly. It can be either be savory or sweet. Instead of using gelatin, I used agar for the vegetarians in the house. 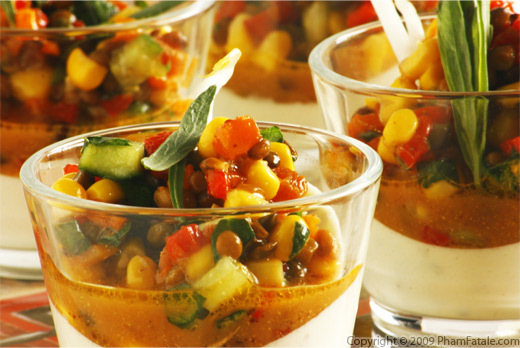 I paired the panna cottas with mixed vegetables and lentils to get a balanced meal with proteins, dairy and veggies. I served them in little verrines. Verrine is just a fancy word for glasses but they are the latest trend in French cooking. If you host a buffet-style dinner, it's the ideal way to run a stress free party as this dish can be prepared in advance. Remove the leaves of the basil and marjoram. Discard the stems. Blanch (dip for 15 seconds in boiling water then transfer in an ice bath) 2 sprigs of basil, the marjoram and 3 sprigs of tarragon, drain, then dry thoroughly of all water, then pat dry on a paper towel. Roughly chop the leaves. In a small bowl, mix the agar agar with 1/2 cup of goat milk. Set aside. In a saucepan, melt the goat cheese into the half and half and the remaining goat milk. Bring to a near boil. Add the dissolved agar goat milk mixture and whisk constantly. Remove from the heat. Add the previously blanched chopped herbs, fromage blanc and the juice of a lime. Pour the liquid into mini glasses. Tilt the glasses if you want a curvy effect. Check my tips section for suggestions on how to do this. When the liquid is firm, plastic-wrap each glass and chill for at least 2 hours in the refrigerator or overnight. Snip the onion chives with kitchen shears. Cut the cucumber into cubes. Sprinkle kosher salt on both sides and let sit for 1/2 hour. Pat dry with a kitchen towel. Set aside. 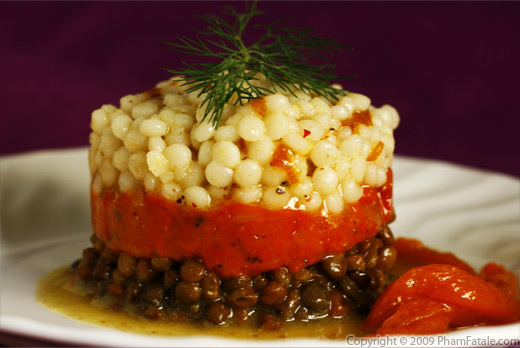 Combine the lentils, dried apricots, bell peppers, cucumbers, corn kernels and capers in a bowl. Season with Himalyan salt and the green and pink peppercorns. In a bowl, dissolve the sugar cane in the champagne vinegar. Add the mustards, kumquat syrup, salt and whisk in the olive oil. Add the pickled garlic. Pour the vinaigrette into the mixed vegetables and lentils mix. Plastic wrap and chill in the refrigerator until you're ready to serve. Finely chop the rest of the herbs (snipped chive, marjoram, tarragon, basil) that have not been blanched. Tear the spinach leaves (do not chop with a knife, it'll prevent the leaves from darkening). Add all the green to the mixed vegetables and lentil mixture. Remove panna cotta from the refrigerator. Depending on what presentation you'd like, dip the bottoms of the glasses into a warm water bath for a few seconds. 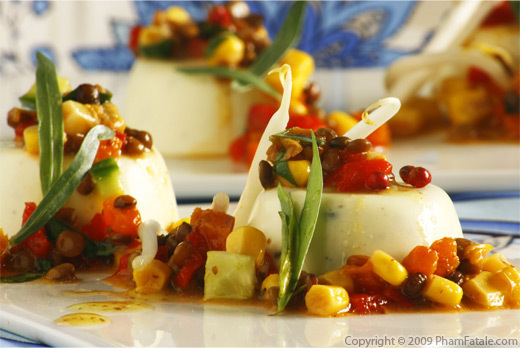 Turn out the panna cotta forms onto serving plates or serve directly in the glasses. 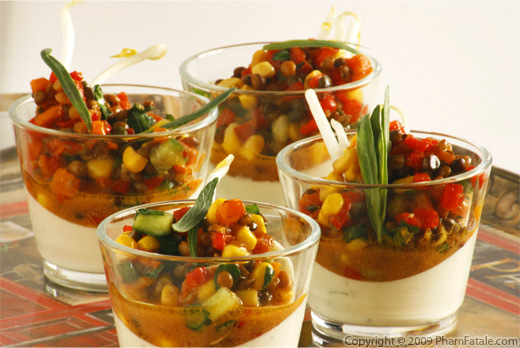 Place a little bit of bean sprouts, then spoon some mixed vegetables into the glasses or on the side of the panna cotta. Decorate with whole tarragon leaves. You're all set. Dig in! I got the precooked beluga lentils from Trader Joe's but you can subtitute with any other kind of lentils or beans. I got fresh goat milk from Trader Joe. If you don't have any, Whole Foods carries goat milk in cans. You can also get it online. One 12 oz can yields 1 1/4 cups. Goat milk has a different taste and is rich in folic acid which my doctor has just recommended to me. I pick a combination of goat milk and half anf half but you can add any dairy that you prefer if you want a creamier or tart flavor like crème fraîche, buttermilk, milk or even heavy cream if the calories don't frighten you. 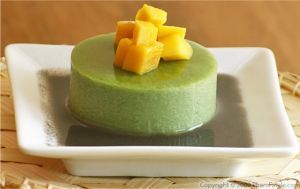 Blanching the herbs will help maintain that very appetizing green color when added the hot panna cotta mixture. I get onion chives from our garden. It's so worth planting them. They are perennials so it's very low maintenance. They are also very good companion plant for other herbs if you have an herb box. The flowers are pretty for an added bonus. The other plus is I only pick the quantity I need whereas you have to get a whole bunch from the store. Snip the onion chives with kitchen shears to prevent them from bruising. Agar agar powder is a good gelatin substitute for vegans and vegetarians. It is derived from seawood and is cooked the same way you would use gelatin powder. It is widely used in Asia. You don't have to use champagne vinegar but for the aesthetic of the dish, a white vinegar is advised. 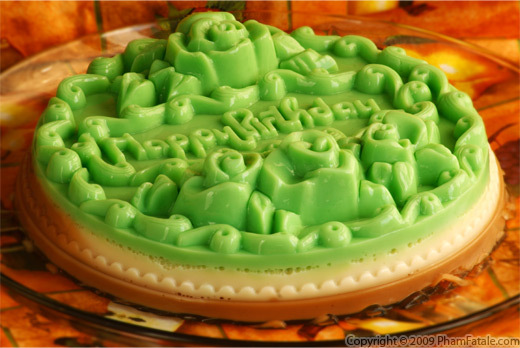 You can also use different shaped molds for the panna cotta, like the one for my Vietnamese jello cake. I used pickled garlic so that it does not overpower the vinaigrette. If you don't mind the not-so-mild flavor, use fresh garlic. Kumquat syrup is optional, I just like the additional of a fruity strong taste to the salad dressing. I just got the syrup from my kumquat preserves. The bean sprouts add a crunchy texture to the dish. It's optional. You can substitute with any other roasted nuts if you like. 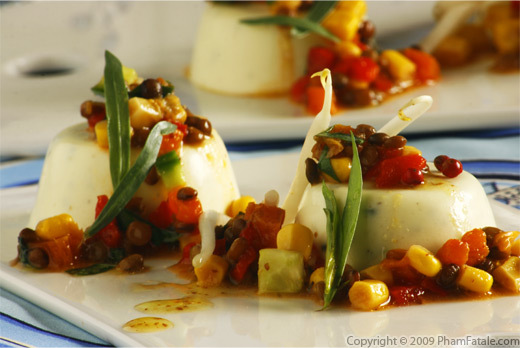 Fromage blanc, literally white cheese in French is a thick yogurt that has a cremier and tangy taste. If you don't have any, you can subtitue with sour cream, cream cheese or any other thick yogurt product. I slightly tilted the glasses to get the pretty curvy effect, then filled up the glass with the mixed vegetables and salad dressing. I used my 4-year-old sister-in-law's legos to tilt and hold the glasses. Published By: Jacqueline Pham on April 14, 2009. You have very lovely food and I commend you for inventing so many wonderful dishes to please your family. The photos you take are top notch. I am hosting a dinner party with 40 guests. We will be inside and outside in the garden. I need suggestions for main courses! Thank you...love your blog and photos are wonderful! 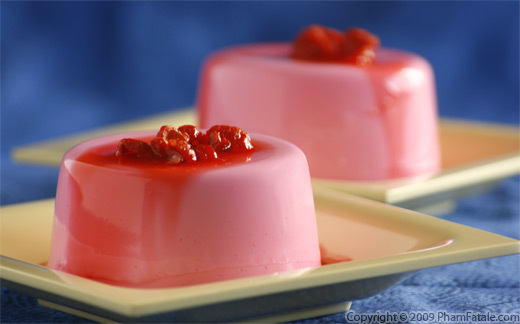 've been following your rece's and wanted to try some of the gelatin ones made with 'agar'. i bought agar powder are the proportions the same as with?? 'agar agar flakes'?